Please note: this post is not a reflection on the writer's political opinions, but rather a reflection on what we can learn from the success of a runaway bestseller. Publishing Twitter, regular Twitter, scary Twitter, international news outlets, and your office’s water cooler have likely been abuzz with gossip about Michael Wolff's Fire & Fury: Inside the Trump White House. After an excerpt in New York magazine drove up preorder sales, the tell-all became the number one bestseller on Amazon in three different formats (source). There are obvious reasons that Fire & Fury has rocketed to the top of the lists and made the rounds on late-night talk shows, but even the hyper-specific nature of this book's success can reveal universal take-aways for book publicity and marketing. Before you dive in, it’s a good idea to get a handle on the basics. Unlock six months of successful pre-publication publicity here. Photo Credit: Henry Holt & Co., 2018. Lesson 1: Prepare for all sales outcomes, both good and bad. Preparing for all sales outcomes is one thing that, according to New Republic's Alex Shepard, Henry Holt & Co. did not do. Holt prepared a 250,000-unit initial print run, which, while sizeable, is not in the same camp as Simon & Schuster's 500,000-unit run for Hillary Rodham Clinton's What Happened? last September. The surmised reasoning is that Fire & Fury is one among many Trump books expected in 2018, so the reading public's interest would not support a massive initial run. According to Shepard's sources, sales reps did not highlight the book when presenting the imprint's winter catalog to indie booksellers either. What Holt should have considered is Michael Wolff's point of difference (POD). In marketing parlance, a point of parity is something a consumer expects if they're going to purchase a product or service from you. Everyone in your industry has it, and if you don't, it's a major disadvantage. Meanwhile, a point of difference is what gives you an edge on your competition. 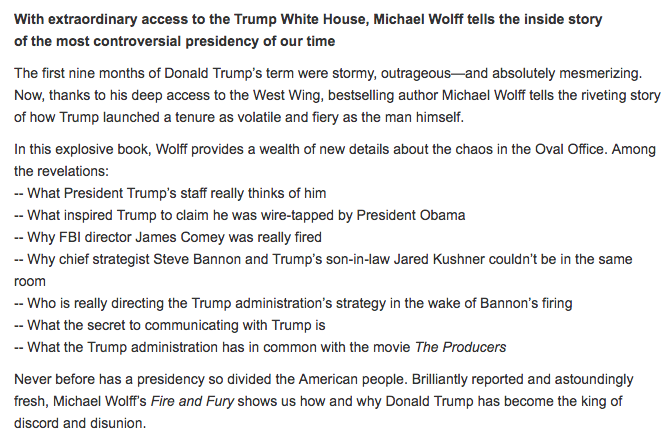 In Wolff's case, the POD was access to 200 interviews and free roam of the West Wing. So, when New York Magazine and The Guardian shared highlights related to the exposé, thereby jacking up preorder sales, most distributors were not prepared. As the almost-sole proprietor of this title's e-book sales, Amazon once again gobbled up market share, while Barnes & Noble and other retailers had to reassure customers that they would restock print editions ASAP. Of course, Henry Holt is likely to use this out-of-stock scenario to its advantage. The #1 Bestseller status is certain to go on future versions of the cover art -- as it should for your book, if it happens to hit #1 in its category on Amazon. Brainstorm your point of difference. What sets you apart from other books in your category? What can you do to relay this to readers? If you receive an accolade like a starred review or hit top seller status, contact your book designer and ask him or her to add it to your cover art. Lesson 2: Take your book’s temperature with a preorder campaign. In a day and age in which readership is low and cohesive national audiences are rare, Henry Holt has launched a household name. When preorders launched to #1 on Amazon, and Trump’s lawyers sent a cease-and-desist letter, they bumped their release date up from Tuesday, January 9, to Friday, January 5. But wait! you may be saying. You just said the publisher wasn't prepared for a big print run. How could they decide to bump up their launch date if they weren't prepared? If this seems in contrast to the publisher being unprepared in Lesson 1, please note that editors submit estimates for initial print runs up to four to six months ahead of publication (source). Create a preorder landing page with a simple checkout form. (Unbounce has landing page optimization tips to help you get the sale more often.) Incentivize early purchases by offering your potential reader an early bird discount or some other added value. Plan a six- to eight-week marketing campaign to promote preorders. If this seems excessive, keep in mind that it takes about seven interactions with a customer before they're ready to purchase (source). If you're really starting to see some buzz, do something about it! Craft a press release as mentioned in Lesson 1, or even consider bumping up your pub date if the final product is ready. In other words, have your pre-publication plans in place, but if you have unprecedented demand (or a libel suit) breathing down your neck, I say, Full speed ahead! Launch early! Psst! ... More publicity tips available here. Lesson 3: Typos can be tweaked in the second edition. As the public received access to Fire and Fury, a couple of high profile typos made themselves known. Most people are taking this in stride, laughing at how silly first editions can be with a rush deadline. Annotated copy provided thanks to Brooks Sherman, 2018. Ideally, you’ll have hired a copyeditor to make sure embarrassing mistakes like this one don’t fall through the cracks. Of course, Wolff had a team of editors and copyeditors at his disposal. We’re all fast readers by trade, and in the case of "pubic appearances," Spell Check isn’t going to catch a word that’s spelled properly. If a reader sends you a strongly worded email, angry about a typo, laugh it off and make a note to correct the copy in your next edition. Everyone makes mistakes. Remember to take them in stride, and correct errors in the next edition of your book. Lesson 4: Appeal to human emotions. But you need to make sure that the reader is hooked and interested, things that will never happen if you yell in all caps at them all the time. Dig deep. Think hard about what gives your book a beating heart. Here, it’s controversy and the fear of missing out: the fact that everyone will be talking about Fire & Fury means that you have to buy it, too. The Amazon landing page for the book titillates the prospective buyer with an almost click-baity list of bullet points. It promises “astoundingly fresh” answers, which most of us crave nowadays, without giving away too much information. Once you’ve drilled down and found your golden ore, use it in the book’s jacket copy, press release, and other marketing collateral. Brainstorm until you find the human heart at the center of your book. One way to do this is to ask yourself "Why did I write this book?" and then follow up with more why's until you get to a solid answer. Use this human heart in all marketing materials and pitch conversations. That's all for this 4 Things installment! I hope you learned something that allows your book publicity to take off. If you’re interested in more book publicity lessons, sign up for my forthcoming No-Stress Publicity Guide. It will be out later this year, and by signing up, you’ll be among the first to know about preorders, discounts, etc.